We’d love your help. Let us know what’s wrong with this preview of Shadowed Promise by Sunanda J. Chatterjee. To ask other readers questions about Shadowed Promise, please sign up. I loved this wonderful and evocative book. Moyna is an amazing woman, strong and determined and I absolutely adored her. From the first sentence the pace never lets up. The author unflinchingly describes the riots and gives an honest and vivid portrayal of life in Mumbai. I really enjoyed reading this book and look forward to reading more by this incredibly talented author. Starting from the suburban Mumbai, Sunanda Chatterjee takes us across the seven seas by the sheer power of her words. I traveled along with Moyna from Mumbai to Beverly hills and with each step, I found myself getting closer to Moyna. I just loved Moyna's character. After a long time, I am reading a character that is complete with all her vulnerability and strength. Her darkness is her curse. The deaths around her are her nightmares. Yet out of that, she emerges as a strong career woman with a h Starting from the suburban Mumbai, Sunanda Chatterjee takes us across the seven seas by the sheer power of her words. I traveled along with Moyna from Mumbai to Beverly hills and with each step, I found myself getting closer to Moyna. I just loved Moyna's character. After a long time, I am reading a character that is complete with all her vulnerability and strength. Her darkness is her curse. The deaths around her are her nightmares. Yet out of that, she emerges as a strong career woman with a heart of gold. The above lines connected me to Moyna. Her vulnerability is at its peak at this point of time yet she is not one of those dames who needs a man to lean on. There were moments I hated her aunt for playing with her emotions. Moyna seemed a much bigger person than me. Never complaining and accepting all the problems that came her way. The characters around her are very well etched. Be it the Aunt to Avinash. From Karan to Sameer. As a reader, I could connect to each and every character of this novel. Her journey from Mumbai to the USA, her enrollment and her making new friends. At this point, I just had one small issue. The smoothness with which everything happened to Moyna. A bit of struggle could have added to her character but then if she had such a childhood, I suppose God had to be kind to her somewhere. But new culture and without much of a cash - somewhere, something must have been tough. No? And then there was a part which surprised me the most. The meeting of Moyna and Bashir. Forgiveness is a very touchy subject with me personally. I don't know, if as a human, I can forget a crime of that magnitude. And in such a calm way. I had the same problem with another book I had read in the recent months. The attitude one has about forgiving - especially the way we writers write it- I sometimes find it very naive. Even I do it. For we want to spread the love and forgiveness. But in reality, can I forgive a person like Bashir? But yes, I do agree with Ms. Chatterjee's logic of Mass hysteria. Very beautifully terrifying. "She’d lose a child she’d borne, in order to accept one she’d abandoned." Even if Moyna is totally surrounded by problems, it's still a story of love and hope. And remember to keep a box of tissue next to you - this story will touch your heart. Moyna's every achievement made my heart swell with pride. Loved this book. I have read Fighting for Tara by Sunanda J. Chatterjee and loved the book. The author is an excellent story teller. Based in the USA, she manages to bring to life both the customs of India as well as the Indian diaspora in the USA. Shadowed Promise revolves around the life of Moyna. Orphaned as a kid, she goes to live with her uncle and aunt in Mumbai. While the aunt makes no bones that she hates Moyna, the girl survives because of her cousin’s affection. Her aunt convinces Moyna that she carries I have read Fighting for Tara by Sunanda J. Chatterjee and loved the book. The author is an excellent story teller. Based in the USA, she manages to bring to life both the customs of India as well as the Indian diaspora in the USA. Shadowed Promise revolves around the life of Moyna. Orphaned as a kid, she goes to live with her uncle and aunt in Mumbai. While the aunt makes no bones that she hates Moyna, the girl survives because of her cousin’s affection. Her aunt convinces Moyna that she carries a black curse within her, the same curse that killed her parents and also brought about a lot of destruction for those who came in touch with her. I don’t want to go too much into this to avoid giving away spoilers. But the incidents that follow completely convince Moyna that her aunt’s words are truthful. Moyna is a brilliant student and dreams of getting a scholarship to study in the USA. The story spans over thirteen to fourteen years, from the Bombay riots in 1992 to the bombing of the twin towers. Through this saga, we see Moyna growing as a character, getting into new relationships, her friends, her husband and a child. But the reader’s focus never shifts away from Moyna. Despite the inner demons that try to wreak havoc with her life, Moyna streaks a path for herself throughout her life. Read the story to see how harsh words can make or break a person. It is a person of heroic tendencies who can survive and come out with flying colours. Moyna is not perfect. But she’s a perfect character with flaws. Well penned Sunanda Chatterjee! I so enjoyed reading this drama. All the other characters, the aunt, the uncle, the cousin, Sameer, Moyna’s friends and the others—make a fitting background for Moyna. VERDICT: This author is an excellent story teller. Don’t miss this one! Couldn't put the book down! From Bombay to LA, the author weaves a story so well, that you feel like you're right there - with Moyna as she embraces all the challenges life throws at her and fights back. It's a moving story of love and hope, I haven't read a book like this in a long time. Cannot wait for more books by the author! When you firmly believe to be the cause of other people’s bad luck – how can you stay around those you love? When disaster strikes you promise to protect an innocent life – but are forced to leave. Do you abandon your responsibility to escape a life of poverty? Will you hold on to the promise even if it destroys your happiness? Is it possible to overcome a shadowed past? Eighteen-year-old Moyna lives with her aunt and uncle in suburban Bombay, India. Her parents have been killed in a car accident When you firmly believe to be the cause of other people’s bad luck – how can you stay around those you love? When disaster strikes you promise to protect an innocent life – but are forced to leave. Do you abandon your responsibility to escape a life of poverty? Will you hold on to the promise even if it destroys your happiness? Is it possible to overcome a shadowed past? Eighteen-year-old Moyna lives with her aunt and uncle in suburban Bombay, India. Her parents have been killed in a car accident and according to her aunt, that’s Moyna’s fault. In fact, every bad luck anyone around her experiences, is Moyna’s fault. When Moyna's pregnant cousin Tania has to go to hospital, an outbreak of violence happens: Tania is slashed down and dies in hospital, while her baby boy Avi is being delivered. Moyna promises Tania to protect Avi and on an impulse, she puts her name on the boy’s birth certificate. As Moyna’s aunt throws her out, fearing her curse upon baby Avi, Moyna leaves for Los Angeles, to study law. At University Moyna and fellow students Lupe and Aaron become best friends for life. Moyna also meets Sameer, son of an Indian immigrant, now a successful lawyer. Sameer, who doesn’t want to follow his father’s footsteps, is captivated by Moyna, her beautiful eyes, her warm smile. She reminds him of a girl his best friend Jeff was smitten by while on vacation in India. Moyna and Sameer are attracted to each other, but Moyna fears her curse will bring him bad luck. Moyna is dedicated to her study, determined to do what it takes to fulfill her dream of becoming a lawyer. But what about her love life, can she overcome the curse of bringing bad luck to the ones she loves? Back in Bombay - now called Mumbai - there’s Avi. What will his reaction be when he finds Moyna's name on his birth certificate? Moyna’s aunt is desperate to keep Moyna away from Avi, but she made a promise to Tania. Can Moyna hold on to her promise even if it destroys her life? It is a fascinating story of a young woman, coping with her past and fate. Moyna is kind, intelligent and yet naïve and insecure. Imagine from childhood on being told that you caused your parents' death, that you are a curse to the lives you touch - how would you feel? Would you possess the strength, the courage to alter your life, to start afresh on the other side of the world? Because that is what Moyna does - you have to admire her determination and dedication building her future. Sunanda Chatterjee has written an inspiring and intriguing novel, a pleasant and interesting read. What I love about the book is, that the author doesn’t judge nor opinionate, but paints a picture with her words, telling the story as it is. The reader easily sympathizes with the characters and learns where they come from, what drives them, what fears and motivation they have. It’s a book that combines and entwines the culture of America and India, respecting both worlds. Shadowed Promise is Monya’s story, a girl who has lived with blame and doubt all her life. She struggles her way to make a better life in another country yet the strings she thought had been severed call her back. Acceptance of her past is her only redemption yet it almost destroys her. Long post Alert!! I loved it too much to write any less! Moyna is one tough cookie, she stands by her words when she is chucked from her house not once but twice. Having earlier read Sunanda’s book Fighting For Tar Shadowed Promise is Monya’s story, a girl who has lived with blame and doubt all her life. She struggles her way to make a better life in another country yet the strings she thought had been severed call her back. Acceptance of her past is her only redemption yet it almost destroys her. Moyna is one tough cookie, she stands by her words when she is chucked from her house not once but twice. Having earlier read Sunanda’s book Fighting For Tara I was not disappointed with this one as well. The strength, resilience, and fortitude that hardships bring to a person are amply showcased in this book as well. It is an emotional read with so much substance with depth and touches the issues like riots and death of near one and its impact and how our lives change due to it. Sameer is her anchor as both of them find each other during college and fall in love. The twist in the tale of how they connect and are attracted to each other is awesome. Sunanda added so many layers to their love story that I was astonished in the end. The knots are solved, the mystery is cleared and the connections made. How destiny brought them together, the painting incident was quite surreal! The book gives an insight to the immigrant life and the challenges they face – a blend of east and west. Quite perfect for our lives today. The characters jump out of the book, Tania for her short stint, even the vile mouth Kakima has her moments. Sameer, her friends Karan, Lupe, Aaron, Mr. Singhania and even Fiona make it very believable and real. What made me a bit crazy was that I just found Moyna’s inability to read the letters immediately when she got them, the curiosity alone would have killed me!! No matter what the content I would want to read them together and as soon as possible. I thought she would never read it!! Another thing odd was the fact that both the kids were very intelligent, brilliant in fact. I found it a bit difficult to accept. The scene with the paparazzi was so distressing and the irony of a birth and death yet the media doesn’t care! The meeting of Moyna and Bashir is so loaded with emotion but the author builds up to it with the role he plays in helping Kakima and Avinash as well as others in the community. We find very few examples of people who get a chance to atone for their sins and embrace the good side. A fine balance struck by the Author. Her writing is sublime, simple and quietly lures me in as a reader. The twists and turns keep the pace of the book making it an absorbing read. A challenge indeed for any mother which she faced is the promise that Moyna makes almost costs her all that she holds dear but it doesn’t weaken her resolve to mother the motherless boy. An emotional story with so much depth and love. Monya is scorned yet she spreads love where she goes – may her tribe rise. What is a Promise? What are the consequences that one faces when one gives a promise to protect his/her near and dear ones? To what extent does one go to fulfill a given promise? What effect does a child’s psych have when the child is branded as unlucky or is blamed as the cause of all the untoward incidences just because there is no one else to blame. Shadowed Promise by Sunanda Chatterjee efficiently portrays how a woman’s insecurity and jealousy can spoil and mar so many near and dear one’s lives. Moyna who is orphaned at a very young age is reared by her Kaka and Kakima in Bombay. But Kakima, for some unknown reason, hates her and keeps taunting her for her existence and blames her for every untoward, natural/unnatural incidence. This leaves a everlasting effect on Moyna’s psych. What I loved about Shadowed Promise is the manner in which Sunanda has portrayed each character’s short comings and strength. Be it Moyna’s fear, her battered, injured, innocent yet strong mind, Kakima’s insecurity and hatred towards Moyna and protectiveness towards Avinash, Sameer’s Casanova image yet his strong love for Moyna, his narrow mind attitude towards adoption inspite his upbringing, his non-tolerance towards bullying, Avinash’s scared and protected upbringing by Kakima, etc all are commendable. Inclusion of Bomaby riots during Babri Masjid demolition and its effect on the protagonist’s life is also mention worthy. Shadowed Promise is a mixture of love, hate, jealousy, insecurity; in other words it’s a potpourri of human emotions. Nice and interesting read, thoroughly enjoyed it. 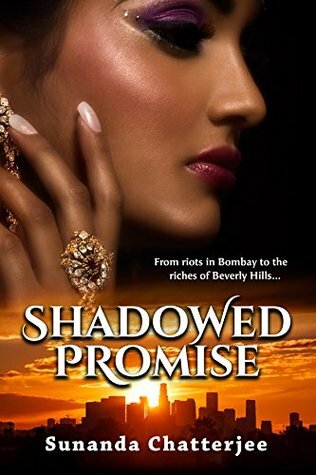 Shadowed Promise: From riots in Bombay to the riches of Beverly Hills by Sunanda J. Chatterjee was a surprise to me. I let a friend talk me into reading this book. I don't read romances. At least, I was told it was a romance. I found that there was some romance in the book, but it is much more than that. It was a journey from a bad life into a new world and the potential for great success. It is the story of a woman of great strength who, despite her upbringing, was determined to make a life for Shadowed Promise: From riots in Bombay to the riches of Beverly Hills by Sunanda J. Chatterjee was a surprise to me. I let a friend talk me into reading this book. I don't read romances. At least, I was told it was a romance. I found that there was some romance in the book, but it is much more than that. It was a journey from a bad life into a new world and the potential for great success. It is the story of a woman of great strength who, despite her upbringing, was determined to make a life for herself. The book was well written with believable three dimensional characters. I was drawn in by the description of life in Bombay, the sad life of the Moyna, and my amazement at how she didn't let this get her down. An intelligent, ambitious woman, Moyna was also confused and mentally abused by her treatment by her aunt and uncle, always careful to not get too close to anyone. A beautifully written story, with great characters written in a simple language. The characters are well developed and realistic. There are not many characters in the story and the author has justified the presence of each of them. The descriptions are detailed, be it of the characters or of the scenes, I could actually visualize the scenes. The conversations between the characters were so realistic, I felt that they were conversing right in front of me and I was actually not reading the dialogu A beautifully written story, with great characters written in a simple language. The characters are well developed and realistic. There are not many characters in the story and the author has justified the presence of each of them. The descriptions are detailed, be it of the characters or of the scenes, I could actually visualize the scenes. The conversations between the characters were so realistic, I felt that they were conversing right in front of me and I was actually not reading the dialogues. The author has taken pains to explain meanings of Indian terms and even relatives’ for the non-Indian reader, or even for the non-Bengali reader. The story is fast paced, with not a dull moment in between, and moves from one chapter to another flawlessly, in a chronological manner, with the month and the year mentioned at the beginning of the chapter. The author has put in a lot of emotions in the book. She made me laugh, cry and smile. One twist towards the end, changed everything for me. Highly recommended, with a small word of caution: The story will stay with you long after you finish the book. Plot, characters, flow, ... everything. The story pulls you into its vortex. While reading and at the end of the book I was like: Now this is some writing and an Author! I finished the 500+pages book in less than 24hrs, which is a feat considering my reading speed and distractions. I never had to remind myself to pick up the book. I was unconsciously pulled towards the book, the story is so engrossing. The flow of the story is consistent, never a dull moment. The language is very good. Nothing fancy just simple words emanating feelings. This was my first book by this author and I got into it right from the word go. There is romance, history, suspense, everyday situations that very often we are unaware of, in short a very enjoyable book that I had difficulty putting down until I got to the last page. What a great book. The reader is drawn into cheering for the main character, moyna, from the very beginning. A story of triumph. Will read more by this author. I love stories from india colorful. Great roller coaster ride of a book...Not a dull moment from the beginning to the end. Lots of love, family and romantic relationships to celebrate life. What a great book! This is truly in the class with the great classics. Great character building and great story building. This is the second book of Sunanda Chatterjee that I have read. I picked it up because I loved her book “Fighting for Tara”. This book too follows the same flow where the protagonist runs away from her troubles in India, hoping for a better life in the USA, yet the secrets of her past follow her. In this book the author has taken up the issue that I am sure a lot of Indian girls face, that of being blamed for all the misfortune and tragedy that occurs around them, and being called ‘Noshter goda” This is the second book of Sunanda Chatterjee that I have read. I picked it up because I loved her book “Fighting for Tara”. This book too follows the same flow where the protagonist runs away from her troubles in India, hoping for a better life in the USA, yet the secrets of her past follow her. In this book the author has taken up the issue that I am sure a lot of Indian girls face, that of being blamed for all the misfortune and tragedy that occurs around them, and being called ‘Noshter goda” or the root of destruction. As the story takes us through Moyna’s journey to the point where she realises she is not to blame for all the misfortune in the world, it also highlights our desperate need for parental approval. This need makes us so ready to believe everything they say and colours everything we do, including our relationships. The riots that occurred after the demolition of the Babri Masjid were described very realistically and brought back memories. One sentence really made sense. The author asks, ‘Who among them (the rioters) had visited or planned to visited the Babri Masjid ? How many Hindus would go if the Ram Mandir was built on the site?” She beautifully brings out how human emotions can be manipulated so that best of friends can become the worst of enemies in a jiffy. Coming back to the story, the plot was good though there was no real suspense in it. The variety of characters in the story added to its charm and each character was well defined. The smaller stories within the main one make for an interesting read. I took a chance on this book and bought it when it was on sale and am so glad I did! The book starts in Bombay (now Mumbai), India, and Moyra, the main character, ends up getting accepted to USC so moves to the U.S. Thanks to her aunt, who raised her, Moyra is very superstitious and has an unhealthy belief in fatalism, especially her personal role in any tragedy that happens to anyone around her. She also has a secret that keeps her from sharing herself fully with others. But s Hard To Put Down! !